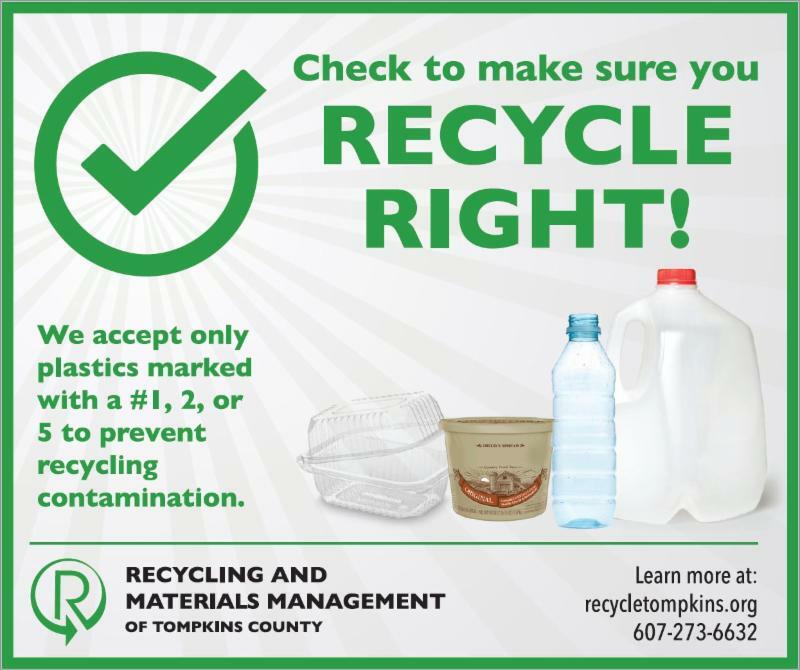 Earlier this summer, Tompkins County Recycling and Materials Management (RMM) announced that only plastics #1, 2, and 5 would be accepted for single stream recycling. This comes as part of an effort to reduce contamination and adapt to changes in recycling markets. You should only recycle a plastic item if it is marked with one of these three numbers inside the triangular recycling mobius symbol. Furthermore, recyclables must be rinsed and free of food residue. Need Some Help Recycling Right? 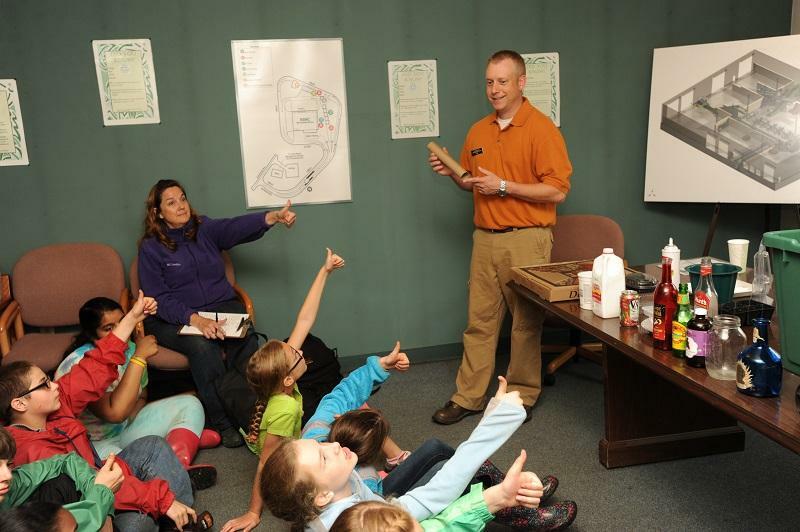 TCRMM staff are available to give brief presentations about new recycling guidelines to community organizations and other groups of residents. Visit recycletompkins.org and contact us today. Don't Miss Your Recycling Day Again! reducing waste and recycling as much as possible. Recently, the Watershed worked with the ReBusiness Partners team to conduct a waste assessment and develop strategies for further waste reduction. 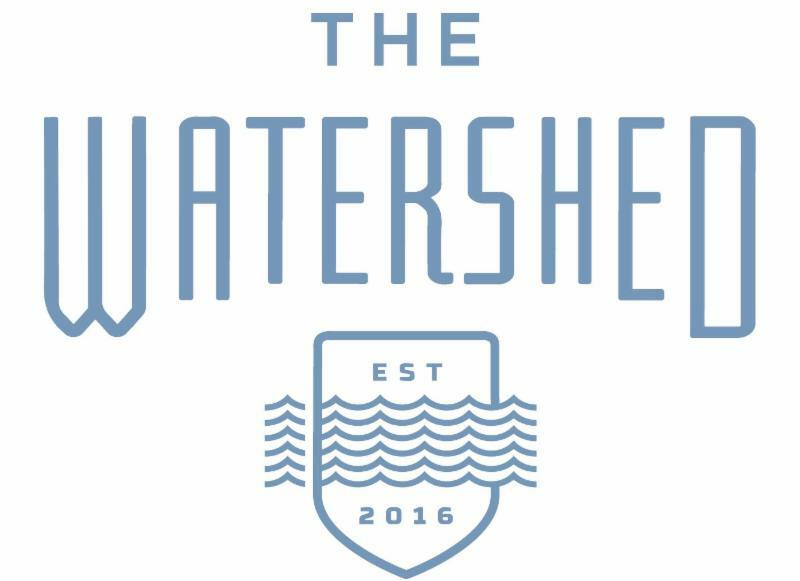 The team calculated that The Watershed is diverting approximately 98% of its waste! They’re able to accomplish this by offering reusable serviceware such as cloth napkins; refusing to offer single-use straws; bringing additional recyclables to the RSWC; and even recycling their wine corks by mail. Join the hundreds of other businesses in Tompkins County that have taken part in the ReBusiness Partners program. Is your business interested in reducing waste? Contact us today at recycletompkins.org. 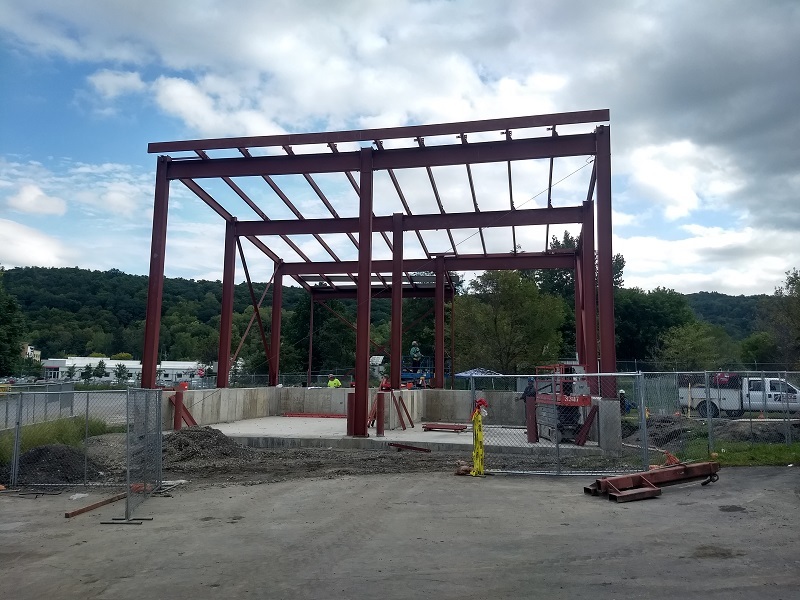 Pictured: Workers construct the metal frame of the food scraps transfer building at the Recycling and Solid Waste Center in late September. RMM Office closed, RSWC open, no change to curbside recycling. RMM Office closed Thursday 11/22 and Friday 11/23. Recycling and Solid Waste Center closed Thursday 11/22. No curbside pickup on Thursday 11/22, and one-day delay for remainder of holiday week. A valid solid waste permit and an appointment are required to attend. 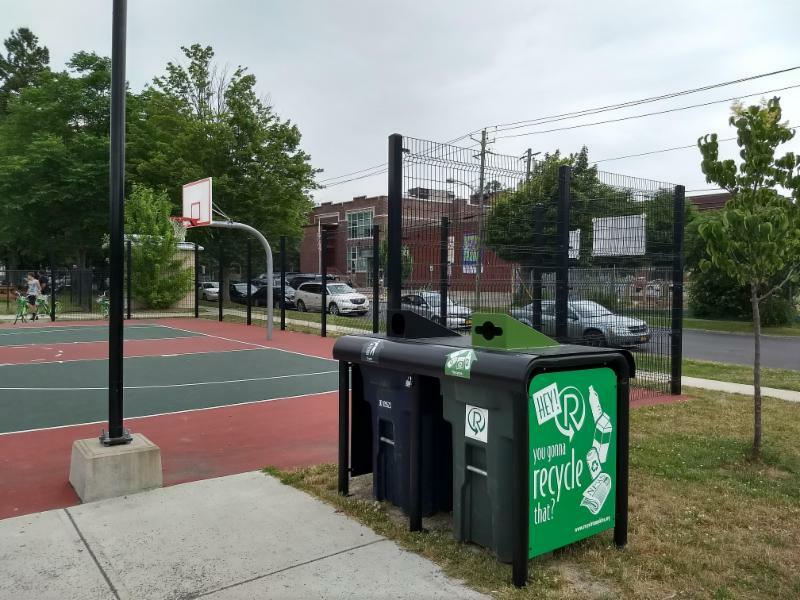 A Public Space Recycling bin was added to the Greater Ithaca Activity Center (GIAC) basketball courts this Summer. Plastic utensils can’t be recycled because they’re too small to be sorted, tend to have food contamination, and aren’t always #1, 2, or 5 plastic. Next time, grab a reusable utensil!